A rare French clock from the early years of Louis XVI's reign. An obelisk in white marble and gilt bronze, the movement signed David Frederic Dubois, a famous Paris maker established in the Rue Saint- Honore. 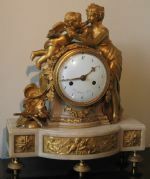 He sold very high quality clocks in cases by Vion, Viollet and B. Lieutaud. This example is by Francois Vion (1764-1800) and probably dates from 1776. 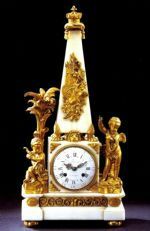 A fine French gilt bronze mantel clock by Daniel Vauchez, 1775 with the bronze work attributed to Francois Vion. The case depicts the triumph of France, the cockerel, over death in the form of Hermes. Twin train movement striking the hours and half hours on a bell. This clock is illustrated in Tardy's Dictionary of French Clocks, and is a particularly good original example.